Fairytales. I adore fairytales. When I was a little kid I used to devour collection upon collection of fantasy tales—a lot of them were folk inspired, actually (have you ever read European folk tales?). I used to wonder, how would people come up with such ideas, how would these events endure through the centuries, heart to heart and soul to soul? It’s enlightening, really, to consider the context of their creation. When winter falls and the days get shorter, the village gathers around a fire. Warmth infuses the hall of the commune, the wafts and sounds of wool spinning soft in the night. It’s not enough to fill the silence stretching in between the crackling of the hearth, and this is the time when fairytales bleed through. From their reality to ours; dragons spread their wings, children find happiness, and bad people get their just deserts. The thing about fairytales is that there’s always a message there. A lesson to be learned, a truth to be uncovered. It’s what makes them special, it’s what makes them dear to children and adults alike. Minerva sits there, in this quiet room, adding logs to the fire. She picks up her quill with a glint in her eyes that promises: “You’ll know“. What, you want to ask, but it’s too late because the gates are open and the imagination is gently tugged around until it’s no longer just a whisper. The first time I read The Dragon of Ynys my reaction was: this! This is a fairytale. A genuinely new story, slotting neatly in the row of centuries-old tales. I watched it with my mind’s eyes unfold in an animation effect, utterly lacking that unnatural feel that contemporary fantasy usually holds. Thinking back from that first encounter, the impression has only been reinforced. Each meander of the story is surprising and pulls further into the universe of Ynys. Not enough to lose your breath, but with a gentle urgency that doesn’t let you get bored. Each new character that enters the scene is surprising in a way that most folk tales fail to deliver. They’re already known, no longer able to reflect the diversity of the world we live in—because even though fairytales are supposed to teach us things, they’re also supposed to help us discover ourselves. And that’s exactly what The Dragon of Ynys does. It offers a glimpse of acceptance, either inherent or learned. It’s refreshing. It’s a story about the importance of stories in creating this blanketing assent that being different is not supposed to be difficult. For me, as a queer person who has struggled against societal disapproval, this story is precious. It’s the kind of book that you’d pick up to read to your children. I know, others have already said it, but it deserves reinforcing. Sir Violet’s adventure sits out there with the classics: a surprising discovery of a craft long dormant. As we, as people, change, so would our essential tales. I don’t think Minerva intended this when she started writing it, but here it is nonetheless. A new-folklore. I hope it takes and storytellers—the heart to soul ones, the regular, everyday inhabitants of this reality of ours—follow in her footsteps. 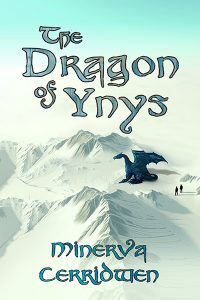 If you’re looking for an aro-ace dragon adventure featuring a lesbian transgender baker and a ballad to acceptance, Minerva Cerridwen‘s The Dragon of Ynys is the story for you.